Are you tired of cleaning dead leaves and old nests from your rain gutters? Leaf screens and gutter guards from San Antonio Rain Gutter Pros are just what you need. We provide a range of products to ensure that your investment remains debris free and lasts for a long while. What are Gutter Guards and Leaf Screens? 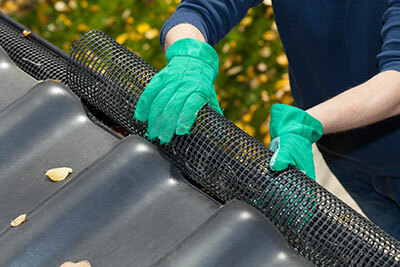 You are probably tired of scrambling on your roof to clean out your rain gutters. But you better do something about those clogged rain gutters. Your landscaping will not be able to take it anymore. How about investing in a permanent solution? Gutter guards and leaf screens from San Antonio Gutter Guard are rolls of mesh or other types of special material that can easily be installed on your existing gutter. This stops leaves and other types of debris from entering the gutter and prevents clogs from forming in downspouts and drains. Loose debris is a fire hazard especially if you are used to flicking your cigarette stubs out the window. Leaf screens and gutter guards prevent dry leaves from accumulating in rain gutters. There will be no fire if it has nothing to catch on. They can keep vermin such as roaches, spiders and mice from accessing your gutters. Other animals will also find it difficult to crawl onto your roof and into your home. Our leaf screens and gutter guards are designed to keep unwanted debris away from your investment while letting air flow through. Is your ladder shaky? Your ladder can slip if you try to reach too far out to grab those leaves. Call the professionals at San Antonio Rain Gutter Pros to install gutter guards or leaf screens for you. All of our services are fully insured and our products come with warranties. Checking your gutters regularly is a good idea especially during autumn. Spring can also cause problems depending on the trees or foliage that surrounds your property. Of course, time might not always be on your side. Let our professionals install leaf screens and gutter guards for you. You won’t have to worry about clogged gutters again.